I’m filing this recipe under “Work In Progress”. Chewy Granola and I first met over at Inspired Taste when Adam and Joanne posted about their adventures making chewy granola bars. They ran into a few obstacles in their quest for the perfect bar. Chiefly, how to get them out of the pan and how to keep them from falling apart into huge granolay crumbles. Since I’m no stranger to recipes that don’t quite go as planned, and they had already identified some of the pitfalls, I figured I could try my hand at them. There’s another reason why I wanted to try making these. I can’t eat most of the prepackaged granola bars. They usually have some kind of seeds or nuts which are verboten in my world. After an especially long relationship with seeds, seeded fruits, and nuts, I was informed that I had to choose between them and a functioning colon. My choice to pass on a colostomy bag has meant that I can no longer randomly pick up a bag of this or a pack of that without checking the list of ingredients. This has resulted in breaking up with many things I used to enjoy eating. But if I am picking the ingredients, I can rekindle my relationship with granola bars. And so it began. I took Adam and Joanne’s recipe, eliminated all those pesky seedy things, and introduced a substitution or two. I carefully prepped my pan, mixed my ingredients, and patted and pressed until the pan was fully of chewy granola goodness. I waited patiently while the granola baked. I waited even more patiently while the granola cooled. When I could wait no more, I went in for a taste. And the damn things fell apart on me. So it’s back to the drawing board to try and find a better way. I’m inclined to think that the granola should A) bake longer; B) cool completely before being cut; C) be stored in an open container, not an airtight one. And please, take it from me…you don’t want to put chewy granola in a plastic bag and then forget about it in the pocket of your coat for a day or two. Believe me when I say it’s not a pretty sight. BAH Tip: Use two sheets of parchment to create a sling for easy removal of the granola after baking. Fold or cut the sheets to the exact width of your pan and then lay them in so that the ends of the parchment extend over the sides of the pan. Heat the oven to 350 degrees and line a 8 or 9 inch square baking dish with a parchment sling. In a large bowl, combine the oats, oat flour, brown sugar, salt, cinnamon, cranberries, and coconut. In a second bowl, or large measuring cup, combine the corn syrup, vanilla, butter, and honey and stir until thoroughly mixed. Add the liquid to the dry ingredients and mix until thoroughly combined. Dump the granola in the prepared baking dish and press it to an even thickness. Bake for 25 to 35 minutes or until the edges are golden brown. Cool the granola in the pan completely before cutting into bars. Serve as bars or crumble into a bowl with yogurt. Store leftover granola in an open container. I didn’t know about the war going on (nuts vs colon). I’d be so bummed! All of my homemade granola turns out a little wonky; never sure why. Kitch, my biggest disappointment is that I can no longer enjoy fruits like kiwi, strawberries, and raspberries. Those tiny seeds are quite pesky and removing them is a whole new level of frustration. Wendi, I feel your granola bar pain. Because what lurks in most packaged bars? Soy. So granola bars have been on my list for quite some time. And some day, I’ll get to them! You know Beth, we could work this into our kitchen adventure on Saturday. Because a granolaless life is no way to live. PS – I made the buttercream from bake! yesterday. Out. Of. This. World. Especially after I added a jar of lemon curd. So what kind of buttercream? Was it a meringue buttercream? Those are always my favorites, but I also love the good old martha buttercream–three sticks of butter! Beth, it was meringue buttercream and I added a jar of lemon curd. Sadly, the cake itself was underwhelming. I’m kind of intrigued by the fact that they fell apart – sounds like it would make good granola to eat out of a bowl with milk. Most homemade granola recipes don’t clump enough for me. So, maybe if I made these with the intention of it falling apart I’d be happy! Jennifer, it falls apart but is VERY moist. Hence the thought that maybe it should be stored in an open container…and definitely not left in a plastic bag in a coat pocket for two days. Does your system have trouble with dried fruits, like raisins? They always upset my stomach, but I have a hard time giving them up. It sounds like they don’t hit me as hard as they hit you though. Jen, dried fruit that also has teeny, tiny seeds are also on the no go list…but truthfully I sometimes ignore the list. 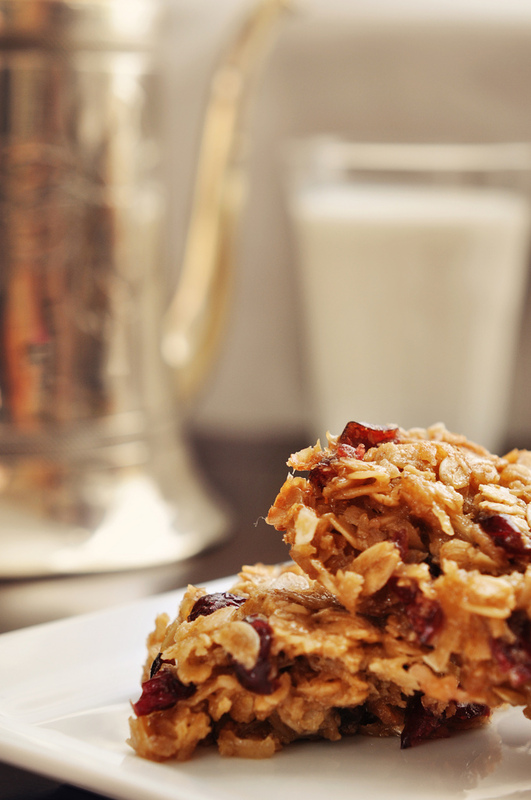 Not often, but it does happen…like when I put dried cranberries into my chewy granola. I imagine crunchy granola would break regardless of whether you scored it before cooling or not. I wonder if you wouldn’t have more success pressing the granola into your pan and then turning it out (like a cake), slicing into individual bars, and then baking till dry. I’ll be looking forward to a solution from your magical kitchen laboratory! And I’m sorry about the seeds and you not getting along. That can’t be fun. Jenna, it usually takes me a long time to come back to a recipe that is a work in progress. But I think Beth from 990 Square and I are going to tackle it this weekend. Going seed/nut free has not been fun. But not nearly as bad as the alternative. Hmmm… if bar form can’t be achieved, what about making a bit drier or have granola bites. The ingredients sound yummy… if it could be bite-sized, I’d be all over that with my yogurt. Brooke, I’m going to give it another go and see if I can’t achieve chewy granola bar goodness. If not, I’m more than happy to stuff bite sized hunks in my mouth. Ever since I started making my own granola, I’ve never looked back. This looks delicious! LimeCake, homemade is always so magical. I’ve got my sights set on homemade ricotta this year. Seeing the watermelon and feta on your blog makes me very tired of winter. Would you kindly send some of that lovely summer weather to this side of the world? My current granola recipe makes loose, dry granola. Great with milk but not so great for eating on the go. I think this recipe will take me one step closer to achieving the bar status I’ve been searching for. Ali, I bet you could do wonders with the recipe to reach your on the go granola nirvana. If I were still eating cereal for breakfast on a regular basis, I would be all over the loose, dry granola. Wendi, thank you so much for adding these granola bars to your kitchen laboratory 🙂 The recipe came from King Arthur Flour and has tons of good reviews – I just can’t figure out why they didn’t work as well for us. But, with you on the case, we are sure a great granola bar will be born! Joanne, Beth from 990 Square and I are on the case! I’ll try and remember to take notes from our investigation this weekend and post a full report. i tried making the granola bars thing and it’s just too crumbly… so i go for the dry loose variety that i can add to my yogurt. Lan, you make a great point about the flexibility to clean out the cupboards when you do something like this. Anna, I beg you to give the granola another try. I made this recipe again today and the results were delicious with very little work on my part. Jen, I made these again today and this batch did not fall apart on me. I substituted minced crystallized ginger for the coconut and baked them for almost 40 minutes this time. They are still chewy but definitely more firm than the first time I made them. I’d love to hear if you successfully worked some pureed prunes into the recipe…seems like a great way to sneak in some fruits. Interesting! We are excited to give your ideas a try in our kitchen. LOVE the idea for crystalized ginger, too! Joanne, the ginger and cranberry combination was a real hit. Like Beth said in her post, all the sugars had gotten very molten like and I think that was the key to these holding together better. This looks fantastic! I “Pin”ed it! Colleen, I made a batch of these last week to take with me to Florida. I left out the coconut because I thought that made them a little too soft. But they are very adaptable to whatever you have on hand.